A gift from God on my 50th birthday.I spotted in my girlfriends yard,in the middle of town, next to a tree,8 morels of different sizes ,3 were bigger than my fist..I was amazed!! I use to hunt them when young in Indiana,with my father.I haven't really searched for any in Ar.,but that changed this morning. thanks, T.D. Found small black mushrooms today in Arkansas. Found 4 small yellows in Boone County, Arkansas on March 28th. Jim H.
We re-landscaped our 20 unit apartment complex this past November and December here in Escondido which is in North San Diego County. On January 5th I found my first large clusters (20 plus) of grey / yellow morels growing in the fir bark. 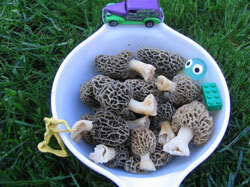 Today Feb. 28 I'm finding morels around the walk ways and planters all around the complex. I'm assuming the spores came in the shredded bark we purchased. The question I have is, Is there a way I can transplant them to my home or help them return next year? Thanks for any info, Steve Renfeldt. They have been popping up in one of my favorite patches since April 7, and I've been letting them grow until they are a good size (thimble to golf ball in 4-5 days). This is in Nevada County, around 2600' elevation, and receives a good deal of sunlight. None of my other patches have yielded yet. Sam L.
Today was one of those fantasy days. I took the afternoon off and in under 2 hours I harvested 267. The other half of them were too small. The location is a burned area in the northern Sierra Nevadas, at about 3800' elev., with the ground still moist from snowmelt. Locals call these "fire morels" or "burn-site morels." 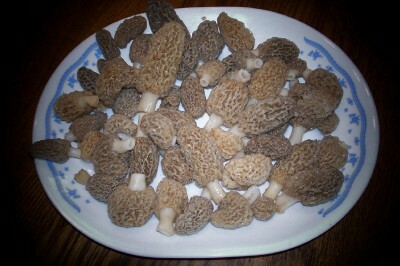 I think they're slightly different from the "black morels" in the midwest, but equally delicious. An enormous bear wandered into my patch while I was lying down taking a photo of some morels. I heard her when she was only 60' away and I stood up, stuck my arms out to look big, and said, authoritatively, "Hi, Bear!" I don't know if she was there for my fungi, but I was happy that she ran away nonetheless. What a day! Found 171 very fresh, very grey Morchella esculenta today in Bladwin County, Georgia. Rich lowlands under Ash. These are some of the prettiest ones I have seen in a few years. Several were "triples" many "doubles". Largest was bright yellow, and 7 inches! Went out yesterday to look for the lovely little shrooms and came home empty handed. Went to Sage Hen Reservoir near Ola/Sweet and seemed like the areas were either too dry or too snowy and wet. Found some false morels and a few toad stool types, but not many. Corral mushrooms aren't up yet either in this area north of Emmett. We were around 5000 feet elevation and tromping around in snow part of the time--but it's melting! Still hope to find some this season, perhaps near Idaho City next time. Relatives in Iowa report many are being found in Iowa and Story Counties. Tom, You asked me the other day if morels were up yet in southern Illinois, to which I replied something to the effect of, "Nah...next week." Well, it's next week. 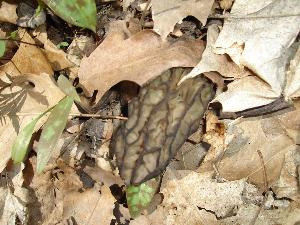 I've attached a photo of the first black morels I've found this year in Jackson County. This is the earliest I've ever found morels this size, 2-3 inches tall (opposed to the microscopic specks I've reported before on March 14). A south-facing, sunny slope, naturally, is where these black morels appeared. So, where does that put us in relationship to the entire morel season? These are the early risers of the bunch, so to speak. Realize that the first morels of the year, unpicked, eventually become those old, decrepit morels people notice during the heart of morel season and wonder when THOSE morels appeared. This is when they appeared, fresh on March 14. And so it begins. But slowly. I probably mention every year that there's really no need for everybody to rush into the woods with baskets just yet; these several morels today represent a fraction of the morels that will appear throughout the next few weeks.Of course, nobody can resist temptation, especially with the knowledge some stranger in southern Illinois will be eating fresh morels tonight. So go to the woods, if you must. But be safe. Obey the designated hours for collecting in state parks and don't enter private land without permission. Finally--although this often seems an intolerable social request--actually be polite to other people you encounter in the woods. 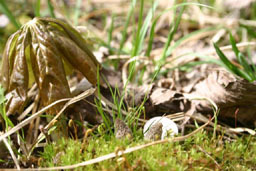 Morel hunters are good people, just like you. Totally insane, but they're good people anyway. Joe McFarland, Illinois Department of Natural Resources. Tom, just a quick note. My son found 140 black morels on Saturday the 18th, average size 2.5 - 3". Found 4 frozen blacks on the 21st. This is in Williamson and Union Counties, Illinois. Bob B.
HI Folks, I made my annual pilgrimage to southern Illinois last weekend and found over two dozen black morels on a southern-facing slope south of Carbondale. Most were 1-2 inches tall and very fresh. With this warm weather and a little bit of rain there should be another flush by the weekend. We've still got about 3 weeks or so left before we're picking yellow morels here in northern Illinois. In almost 20 years of picking I have yet to find a black morel in Cook County.. Jay D.
hey Tom, this is nancy from christian county illinois. march 30, found 14 mushrooms black. most were small but 2 were about 3 inches... now friday will bring more. this is 3 days earlier than last year. good luck to everyone this year. last was a good one. hey tom, nancy from christian county illinois. found about a 20 each day for the last 4 days. temps up and down. had a nice day yesterday, sunday, plan to go out after the winds die down. good rain last night hope it produces a major amount of shrooms. they have been pretty small 2" or so got a couple that were bigger. they also have lighter in color but with the cooler weather they will be getting darker. hope it's as good a year as last. good luck everyone. Mason county, IL -Found 1 small grey in yard. It seems early, but we had 2.5 inches of rain a day ago, and it's 75 degrees today. Found 106 blacks in saline co. an 40 week befor in CAVE HILL AREA spoty at times with a few patchs of 20- 25 size were averge 3inch to 4 in. tall an 2 1/2 to 3 inch base realy nice. Not uncommon to find at least 300 or more this size in a day of picking. But posted signs in shawnee forest say no picking till after 1 pm this to me isnt fear sence area is open to anyone but morel hunters at this time!! JEFF FROM SALINE CO.
Terry from Pope county Ill. good day hunting in pines for blacks one hole gave up 134 good ones .Alot ofone's and two mushrooms, next week should be prime if wheather is good . Found 96 nice greys and yellows on 4/9/06 in western perry county, IL. Looks like another great year. larry from greene county, started finding a few very small greys, south facing slopes. Found first grey in Peoria County. It was ¾ of an inch tall. Happy Hunting. I have found close to one hundred blacks in the Mclean Co area happy shrooming Bruce. found 18 gray in Butler haynes park! hollis park distric in mapleton ill. i think thats peiria county1 thax! Found a total of three on Saturday just north of Springfield, IL. Found them within 5 minutes. Nothing the rest of the day. Josh N.
Found 13 grays in Havana, IL. Fulton county I think. Hey, its Bill I found 5 greys yesterday in the Kickapoo area. My friend troy Todd and I, Jeff, found 38 grays on 4/15 and 361 grays and yellows on 4/18 in Peoria County in Peoria Illinois. E-mail me back if you need more info. 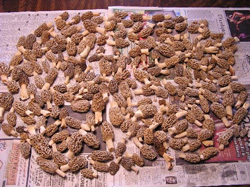 Dave P. of Elburn, IL phoned a report of finding nine gray morels in a walnut grove. Largest was 2" with the remainder being half that size. Vicky went out this morning to one of our early spots and came home with only a deer tick crawling on her arm. I went out mid- day to check a couple of other areas where we've found them early in the season. I'm pleased to report that I found one lone "scout", a grey esculenta about 3/4" tall. It was the only one I found. Of course, there are probably others nearby, but not easily seen when they're that small. Mother Nature is being very cooperative as she has blessed us with about 2 " of rain since Thursday night. Also had a hail storm with stones just slightly smaller than golf balls. They pounded the area for about 12 minutes straight! I've never witnessed a hail storm that lasted that long. Our front deck was covered with them about an inch deep. It looked like it had snowed. The season for Marshall and Putnam counties has begun! Tom Nauman, Morel Mania, Inc.
My friend and I went out today just to take a look around and to our surprise we found 31 nice ones. It is a little early for Kendall county, but we'll take them! found April 17th, in Fairview Heights, Il. There's one fresh gray but the rest are yellows. I'm trying to keep the faith but, if we don't get some rain soon, that's all she wrote. Right now, I've found 1/3 of my worst year ever!! 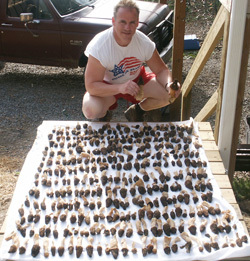 Larry K.
Tammy & Mike found 70 morels today in Shelby County. Most were gray, about 4 of them were black. Sizes ranged from 2" to really small. The blacks that we found were about 4". One patch was in a gulley and another patch was on a hilltop. Good Luck to you all! Found a total of 48 grays 1'' to 2'' tall in nothern shelby county today. A fri end of mine found 23 blacks this morning with the biggest one measuring 7'' tall. Its my favorite time of the year again. Good Luck all. Found 10 greys this morning in Kankakee County, ranging from 7/8 to 1 1/2 inches in height. My first sighting, a little clump of two, I co vered with leaves to let them grow. Later on there was a small patch, with a clump of four. Wheeeeee! Left one of my "catch" for the proprietor of the area. Will dream all day about what to do with the other seven. The season is on, fellow hunters! I found some yesterday 4/18 in Carroll Co IL. They were all in one spot. Found 15 small greys on 4-19 near Marseilles. Broady, Marseilles,Il. Hi , I found my first gray morel today in Kankakee IL. 04/20/06. I found a bunch of small one's, and one good one, I found two new spots, its going to be a good season!!!! Mitch and Sue found this mess all in one spot in Fulton County on 4/20/06. I found Morels in Elburn, Illinois today. Elburn is in Kane county. I have never hunted these in my life, but a friend told me they were real tasty so I thought I would satisfy my tastebuds. They were very good sauteed in butter and then sprinkled with fresh grated parmesan attached to a morsel of a porkchop. Mmmmmm. Bye for now. Ray N.
Me (Steve) and my son (Matthew) found 71 around Princeville Illinois, these go with the 30 found last Thursday. Found some yellows in Putnam County Illinois (Granville)...going out to actually hunt some this Sunday! Found some 4" greys and yellows. 30 total. Been on hands and knees for small greys, but this place had trilliums and mayapples 1' tall. Must of been a hot spot. LaSalle Co. Broady. found 16 in ottawao4-22,hope for more in the days to come!!!!!!! Found in Kane county Illinois west of chicago. Sat the 22nd we found around 25 mushrooms. I went back to the same spot and found another 9 or 10 on the 24th. On the 25th my girlfriend went with me and we found another dozen or so. We also found two small ones growing right in our back yard. We found mostly yellow morels with a few half free morels. The two found in the back yard were black morels. We have been experimenting with washing the morels and saving the wash water and sprinkling it around the house to spread the spores. Its worth a try. Jamie, Tami, Rachel, Amber and katelyn. Found 12 greys and pecker heads mixed. Greys were only about 2 inches. What a great day! We found 81 morels in Marshall County in wet land near the river. Haven't found any in any other locations. Hope to go back out tomorrow. Don and Jana S.
Found 63 whites, and 17 small greys. I mean small. The small ones were 1/4 inch or smaller. Kept walking and found the bigger ones on the bluff, facing the east. Broady, Mars. Il. Found good size yellows sunday.Spot I had never looked before. Going out again tomorrow hopefully I will have some luck .I found these mushrooms in Mclean county.Good luck to all. I have found 3 mushrooms next to a ash tree in my yard I live in E. hazel crest, ill & never had them grow in my yard. should I stop cutting the grass? ha! ha! . they are 2 to 5"" tall. the date was 4/23/06 and do you think i will find more??? thanks jay. Hey! This has been my best year ever hunting mushrooms. My husband and I found 5 pounds April 25th, and on the 26th we found another 3 pounds. They were all grays but I'm sure the yellow ones are coming soon. We haven't been back out since but we will be going back out today. We found all of these mushrooms in Henry County, IL. I found 235 greys today in two different short expeditions. One was a recently burned area, one was just plain old woods. Found 120 of them around one big dead elm, the most I've found in one spot at one time. I'm hoping some yellows will follow. Janet in Ogle County, IL. Got 81 large yellows and greys, 5" to 8". Never seen greys this big. 4-29. Its been a hot spot this year. My pal got about 30, but he tripped and got the wind knocked out of him and had to leave. Went out today to another spot and fo und 53 yellows. Most were spored and dry. Broady, Mars. I found this group of 12 in one cluster in Henry county, Illinois on Monday, May 1. DuPage County â€“ 8 Yellows at a new park. The Jerzy Hunters We are very excited about the Championship on Saturday. My first ever successful hunt! Found 40 gray morels Wednesday 05/03/06 in assorted sizes from 1 to 5 inches. The excitement between my 3 1/2 year son and me was priceless when we discovered the treasure trove. Consider me hooked, I have fungi fever!! Matt K. - Lake County, Illinois. found two small yellows ,looked on the east bluff and saw BIG YELLOWS. A greenhorn could have spotted these. Straight up hillside, but worthwhile. Got 63 Giant yellows, 7-9 inches. About 9 pounds .2 greys 6and 1 half inches. 12 more yellows that were fresh, all stem tho. Left 4 yellows that were to far gone. Bad sign for these woods. Seems like these giants are a cross between the half-free and morels. More stem than fruit. Broady, Mars. FOUND 1 POUND TODAY OF GREYS IN SCHAUMBURG AND 5 POUNDS IN MINOOKA ON SUNDAY. FOUND FIRST EVER FOR ME A SET OF 3 GIANTS DOWN SOUTH. CANT WAIT FOR MORE!!!!!! Found 918 yellows and greys in a total of 7hrs from 5-1-06 to 5-4-06 best year ever.The rain came at the best possible time.Had the time of my life.Will send pictures. Me again (Steve) and my son (Matthew) found these 5/4/06, plus a lot more to go with them. A good year so far, lost count on how many we have found. Princeville, Ill. The greys are popping in N. IL!!! Good Hunting this year!!! 170 (~7 lbs) morels found in Cook county, Illinois. Hit the motherlode. 95 Percent of those shown in the picture were found in a 45'x100' patch. It was simply one after another for as far as I could see. And most of them were 6+ inches. Unbelievable. found about 2 dozen black morels. Then today the 11th found patch of blacks and 15 tiny gray. Need rain ground is windblown dry. Possible showers tonight and warm temps (70's and 80) for week so we see. Found 1 small mushroom today in DeKalb County, Indiana. 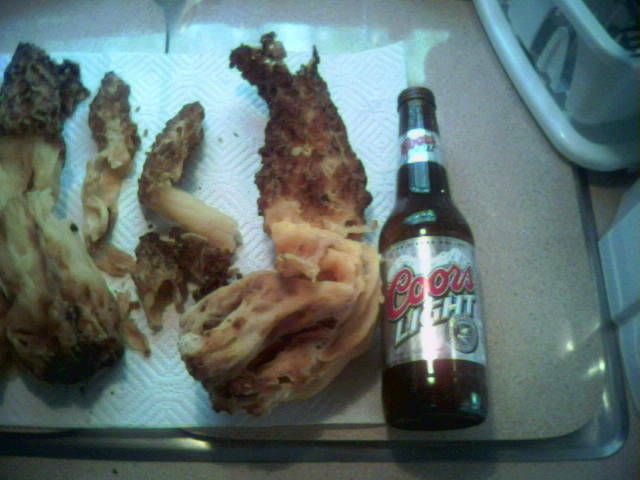 found 65 morels 1-3 in later the same day my wife & I found 75 morels from 2-8 in tall some heads as big as coke cans. 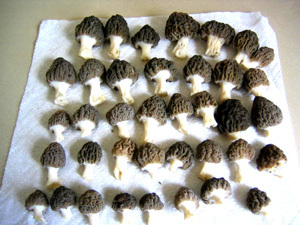 Wayne G.
80 gray morels 4/14-17 found in Huntington County, Indiana - they’re back, but only in early spots for now…. 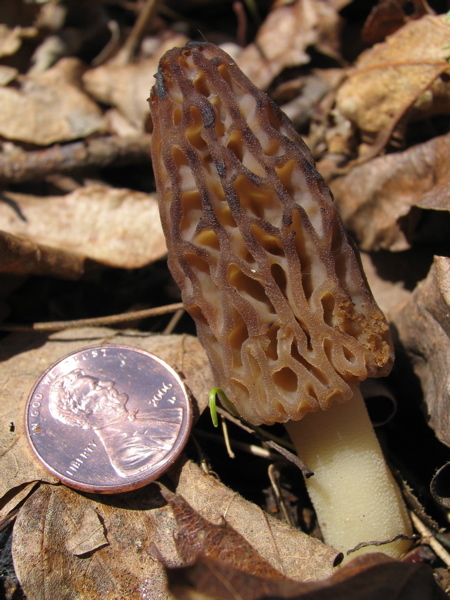 Found 80 morels (grays) in early spots near apples and elms in northern Indiana Friday through Sunday…..Huntington County area……they are out! found 8 GRAYS in the hammond area J.J. & R.J. I saw a bag of mushrooms at a friend's house on 4-14 it had about 20 to 25 fresh blacks about 1 to 3 inches in height maybe a couple pounds in weight. That was in noble co In. And thats enough motivation for me happy hunting the trespasser craigy t allen co In. found 3 blacks, left to grow. Had a nice rain Easter Evening. Found more 3/17, and the other 3 had a measurable grown. All still growning. Looking forward to a great season in Noble Co. IN. Huntington County Indiana – 120 small grays found in past three days near dying elms. Some appear to be nearly white in color and are extremely hard to spot. Spotted growth of more new morels in various areas, too small for picking. Next week should be prime if it rains this weekend. Good hunting to you! HERE WE GO! FOUND 45 IN NORTH CENTRAL IN. MICHAEL JAG. We are near Princeton, IN. over the past week we have only found a few dozen. We have usually found a couple hundred by now. Found about 80 assorted morels here in SW Indiana 4/23. Two patches, one with about 20 the rest w ere on a very steep coal/shale bank in a forest thatâ€™s a reclaimed strip mine in Pike Co. Had the time of my life, finding mushrooms out in the forest with my son. Dave M.
Found two greys in the back yard 4-26.06 one about 2 inchs the other about 1 1/2 .northwest In. Finally found some today after looking all week. Found about 30 small greys in NW Indiana. Found about 150 greys and yellows in the last week. about 50 of them were 5 - 7 inches! waiting for the sun to come out after all this rain. Justin W.
we found close to a pound of morels two weeks ago in noble county (NE IN), including one that was bigger than my fist and probably close to 1/2 pound all by itself. TASTY! but i'm still trying to get rid of the poison ivy. My husband and I found these four morels today April 12th in Hamburg Iowa. The season has STARTED!!!!!!!!!!!!! Finding several patches of small greys south of Iowa City. Rain this week will only help! As long as the tornados don't blow them away. Looking forward to finding yellows. I went out to some of my favorite hot spots today. Came back with 53 big yellows and a smile from ear to ear. Looks like a wonderful year again! I found a couple yesterday on south slope but when I went over to two newly dead elms on a west slope, I found around a hundred very small grays…none that I picked and one tree over found that some grays that had been out longer and picked a nice batch for supper…around 80. These were all just newly popped….with rain forecasted for most of the week, it could be a banner year. Found 10 VERY LITTLE grays in Johnson County Iowa-picked one just for show....should be good picking in 7-10 days. Brad. Found 4 greys,very small on Easter Sunday in LaSalle Co. Found 2 small greys Tues., 4-18. Its here!!!! Broady, Marseilles. WE GOT 173 BLACKS AND GREYS IN JOHNSON COUNTY ON SAT, APRIL 22ND AND ATE A NICE MESS OF THEM LAST NIGHT!! Found 358 yellows and greys on 4/26-4/27 in cedar county iowa. Cathy Sylvain found this giant Yellow shroom on 4-28-06 Miami County Indiana at base of very large elm tree stump. no other shrooms around it. More than 480 Yellows and Grays this year and climbing daily. went to northern lower penninsula michigan this weekend. found 327 on saturday. found another 44 on sunday. all morels were blacks. we need rain!!!!!!!!!!!!! Jimmy from Muscatine, IA reports "wheelbarrow loads of mushrooms in the Mississippi bottoms between the river and the bluffs. Yellows on the Iowa side and grays on the Illinois side. 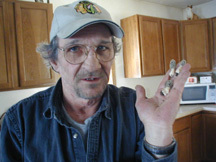 found about 30 pounds of grays and yellows, the 1st of may, was south of Chariton, Iowa Griff. going to be another great year! Ok just wanted to fyi you that I found 21 half free morels. Right outside of Cedar Rapids IA. Not quite full on season but its getting there. Found lots of fresh mushrooms in NE Iowa May 4,5,6. Should be a good week along Iowa/Wisconsin border. Finding lots of greys and yellows in Tama and Black hawk counties. Going to be great year! I found 18 grey morels today on the river in Northeastern Kansas. 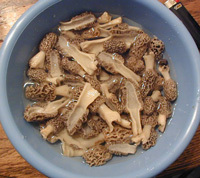 We found 48 Morels after work today, 04-12-2006. Some real nice ones. A "WalkBy" award went out too. No rain and dry temp around 86° today. Hey all you shroomers! We needed rain really bad, got it, now it's turned chilly again. On 5/15/06 my 2 sons and I found about 9 yellows on a southern facing bank along a creek. They were nice sized. But that was it. Hopefully it warms back up soon! We are in northeastern Kansas, near the Missouri River. Went out for two hours and found six nice yellows on 04/20 on the banks of the Kaw River in NE Kansas. It hasn't rained here in the last couple of weeks and that is hurting our chances. If it rains in the next week morels could be poppin'. No rain and it will be a poor year. That's what makes em' so special. I've found 3 small black ones today(april 2) near Barbourville. I live in the Garret Co. region of maryland.....have found a few blacks over the past few days. Seem to be more plentiful in my area this year, at least so far. Happy Hunting everyone !! 1/2 pound of large yellow morels in a mulched area under azaleas. looking forward to the result of the 3-5" of rain we're getting this week. 3rd year in a row, morels found in my yard here in Worcester County MA (eastern Mass, 26 miles from Boston) Found a variety of sizes from very small to 2 inches. I don't think they are common for this area, and I'm wondering if the original spores were in the bark mulch spread around my flower beds. But, regardless, they keep coming back in the same area. I have been looking for a morel on Cape Cod for five years. Your morel sightings page geve me the hope to keep looking. I just found a three inch black morel at the edge of some mulch along a public walk in South Yarmouth. What a great day. Just found a dozen morels growing in my yard just outside Boston. Never seen them in real life before, had to check the Web to be sure. Still trying to figure out how to cook them. Alden,. 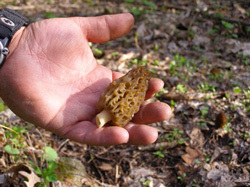 MI (NE of Traverse City) April 13th Found 7 morels in a 10 minute search. Not large, look like they just popped but had rain yesterday and conditions are right. Bruce M.
In Otsego, Mi (Allegan County) they are popping up all over the place! Found lots of yellow sponges and a couple little black ones! We had good rain this week and it is supposed to get warmer, should be good 'shrooming! Rich A. Found first mushrooms in southerm MN, May 1 all grays and just a few. But it is the start to may be a good year. found another 112 mushrooms this time they were blondes, southern mn we had just had a good soaking over the weekend so they are out if full force now. Happy Hunting! A.O. found some in Wright County MN, May 6, 2006. Just beginning up here! Found just 2 of the black variety this past weekend, looks good thou for the season ahead. Becker Co., MN Sharon K.
Found four medium size and two really large blonde on May 15th, in Clay County. Lance A.
I have found many pounds of morels in southern MN for the last two weeks.The ones I am finding now are big and a lot of old ones now.I dont think the season will last much longer here,but it is a good season this year. I'm not a mushroom hunter, but do have a morel growing in my yard in northern Crow Wing County. Southwest Missouri! It is about 61 here today and windy. I just my first morels of the season, in one of my little spots. They are the tiniest I have ever seen, and there were some pretty small ones there last year. I found 13, the largest maybe 1/2 inch high, the smallest about 1/8 inch. I would have left them, but the tips were already dry. I am ecstatically happy!! Hello everyone this is Tom in Creighton Missouri my son chad and myself just found 2 two x 5/8 inch tall greys ,its on now we've had moisture and more on the way and just the right temps I think we're looking at a potential BUMPER CROP!!! GOOD LUCK EVERY ONE , and oh yeah, WOOOOHOOOOO !!!!!!! KC Amicus – Kansas City Missouri Metro, on Friday, April 7th found 18 small greys (biggest only 2”). On Saturday, April 8th found an additional 32 (10 grey and the rest yellow). CW found a patch of 33 black morels in St. Charles, Mo. I regularly hunt an area in North Saint Louis County. I have been visiting same spot for 15 years now. I found a place that the mushrooms seem to grow ahead of the rest of the season elsewhere. I went to that place on Tuesday April 11th, and found two fresh tiny Greys. In every prior year, this signaled 4-8 days till mass blooming of the fruiting body. With one more decent rain, I believe that Saturday will mark the season in earnest. We have been out the last two evenings. Found 74 blonde morels,anywhere from 3-5". Beautiful day again today!! I will make it a short day at work and hit the timber!! Grannyg- Caldwell county. Found about 5 gallon in Northern Central Missouri. Some of the usual spots had nothing or very little. Like everyone else is saying, it has probably been too dry. We found both tiny fresh grays and fairly dry medium-sized yellows. We found a few very dry and very large yellows around Smithville, Missouri. I'd say the season around here is about over. Found about 20 small grays in south eastern Nebraska. Need rain badly. 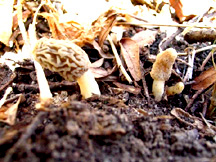 I found about 40 yellow morels around Decatuer, Nebraska on 4/17/06. They were in thick timber along the Missouri. Please add this to the list of sightings. We went out today and found about a pound of smaller morels 1 1/2 to 2 inches tall. A lot of them were dried out from all of the wind here (and lack of rain). If we get a good rain we should really be in business ! went out on 4/ 18, 4/19 , 4/21, 4/22...it was AWESOME , found about 2lbs. first afternoon, and it just went up from there...great day on Saturday afternoon 4/22, about 300 to 400 yards back from the river (along the Misouri north of Omaha, hit a patch of fresh yellows about thumb length and meaty...picked in one area for about 45 minutes before they got scarce .grass was a little high and we were literally stepping on them,!!!!!! best patch i have hit in years. ended up with about 11lbs. between the two of us just from that area !!! supposed to rain here tonight.. (4/24) if so, I expect bigger yellows begining to go to the hills by the end of the week. Great year so far, all we needed was a little rain here. good luck to all the brotherhood of shroomers!!!! RICK J. 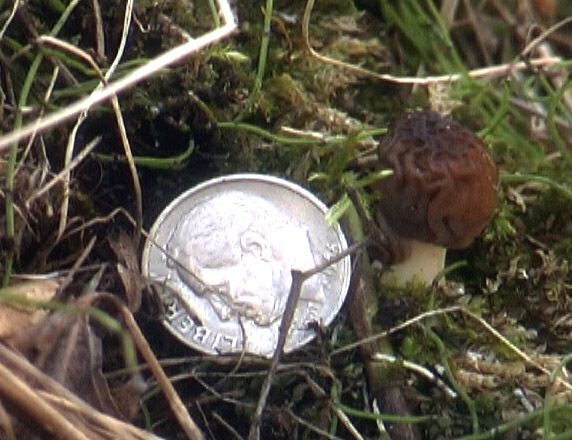 5 inch tall; 2 1/2 inch wide black morel near Truckee River under Populus sp in moist disturbed soil at elevation 4400+MSL on April 26, 2006; day temp 70 degrees F by J Conners. Found 20 small yellows 5/9 in southwest New Hampshire around an ash tree. 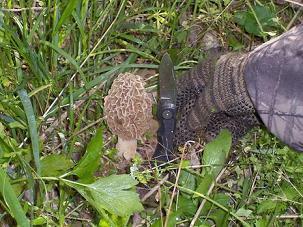 Parish, NY 13131 5/ 26/06: I found my 1st Morels while chasing an escaped Chucker Partridge from our game bird coupe. Three blacks 2-3" range, I feel an addiction coming on. Got about three pounds so far, scattered, no mother lodes, half greys, half yellows, no blondes yet, no pattern to their appearance except the obvious that they are mostly in the moister areas. Season could be in jeopardy, as today things seemed very dry, and I saw no just-popped ones this morning, and there is no rain in forecast for six days here. Maybe a late pop of esculentas? Mmmm morel pilaf. Happy hunting all! Shroomer Dave. Saratoga County, New York. On May 7, I came across one in my own back yard. On May 18, I saw two others on a property about 15 miles to the north. In both cases, the trees in the vicinity were mostly black oaks and white pines. 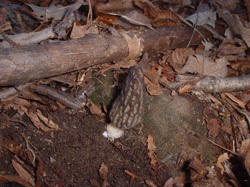 Attached is a photo of one of the latter morels. MY NAME IS PEGGY L. AND I PICK IN THE TURTLE MOUNTAINS OF NORTH DAKOTA.. MUSROOMS ARE GREAT THIS YEAR WE HAVE OVER 6 GALLONS IN THREE NIGHTS. BUT ALL IN ALL NEIGHBORS AND FRIENDS THERE HAVE BEEN OVER 25 GALLONS PICKED . Just returned from Florida yesterday - was too late to go out last night - hit my patch right after work - small blacks from 1" to 2 1/2 " - my south patch is the only one producing at this time. 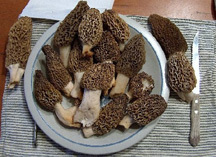 Rob H.
190 Black morels found in northern seneca county, ohio last week 4-10 thru 4-16, from 1"-6". Looks to be another good year. Found several 4-13-06 waverly Ohio. found 29 small grerys 1/4" to 1/2". Kids put mason jars over them, returned on 4/16 to pick 3 1/2". On 4/18 hunted a overgrown railroad track found 42 blacks and blonds 2 1/2". Had to cheat alittle to many leaves. (leaf blower) North of Dayton , Ohio. Good luck Hunting!! found 10 small greys and on 04/23/06 found 4 more small greys in Portage County, Ohio. They sure were small, but hopefully this is the start of a good season. auglaize co. ohio, have had the chance to shop the woods & have only found 4, others I know have found Many! Good Luck to All!! Northwest Ohio is starting to bust lose. Conditions appear near perfect with a few showers predicted this week. Found a few blacks yesterday morning in an old growth woods then hit many greys, half morels and yellows in the afternoon in thicket areas. found 1 sm. grey about 1 in. yesterday. j. king osage co. ok.
found 4 sm.greys on apr. 2 . then found 16 sm. greys & 16 sm / med yellows on apr. 4. j. king osage co. ok.
my dad & i found 5 sm. grey/yellows & 1 med. yellow..j king osage co. ok. Very dry conditions in Tulsa area; found 1 on 4/10 and 3 on 4/11 in places I usually find dozens. They were in perfect condition however, as if mother nature sacrifices quantity over quality. dean m., tulsa, ok.
We decided to take a look around Wednesday and found our first of the the year, it was the only one today, but I'm certain he'll have lots of relatives popping up before too long. If there's any huge amounts, I'll be sure to let you know. After two hours of searching I finally found this year's first, ten nice black morels on the very top of a wooded ridge. They were surrounding a dead tree, just like the textbook says. I still haven't eaten any though. I think I'm the only one around here who hunts morels, no one is ever in the woods looking except me, and when I tell people I'm going to look for morels they look at me differently. Geoff, Harleysville Pa.
Found white about 50 white morels today in south western pa. Good times with buds. Anticipating more real soon. Most found under dead elms. We had a good day today. We found 113 black and gray. We found about 3 dozen last night in Washington, PA (South) of Pittsburgh. 3 to 4" in size. Can't wait to eat them up. I think we'll have even more luck in a few days! found these in south central pa under apple tree in back yard!!!!!!!!!!!!!!!!! found 18 yellows (5/15)under a dead elm on a north facing slope. no morels under any other elms in the area. was pretty cold today, some sun may help a few more pop. Went out for three hours in the morning after some nice evening rain. I found 6 half free's , 4 greys, and two blondes. Some of them definitely could have been given a couple more days of growth but the fact that the area I was in is now heavily searched and possible high temps in the seventies led me to take no chances. I made one of my favorites for lunch; pan fried morel, lettuce, and tomato sandwiches. It wasn't the mother lode but I was pretty happy. Jeff from Rhode Island ( at my Mom's for Morel vacation ). Hauled home 10 lbs of nice large yellows from Vermillion, SD. One mushroom I found weighed in at 1/2 pound! Went right after a good rain. i have been finding black morels for about week and half now close to center hill lake. monday found 65 blacks, also found 12 small greys under a ash tree, need to rain alittle more. this weekend should start the foray. i live in smithville tn, i've found yellows in my backyard in the past, next to a the creek, hope they pop up this year. Waterbury, Vermont - While mowing the edge of the lawn adjacent to some decaying brush piles and apple trees, I stumbled across a 4" morel. First I've seen in the "wild." Will need to start keeping my eyes peeled for more. I had witnessed some foragers in a wooded section of our land the prior week. I assumed they were going after fiddleheads, but perhaps not. Several old apple trees are interspersed in that area. Found 18, mostly yellows (or were some of the "greys" just immature yellows?) in various locations. I'm in North Central Vermont, most found in Orange County. These were found mostly on banks near or on old/current pastures, near/under apple trees. Often see yellow violets nearby. Two found in a ditch, near wild lilies of the valley and bloodroot. Looked again on 5/24, not much luck, as it hadn't rained too much. Since have had a few downpours and hope to find more today. Recent wet weather and some heat and we finally have some shrooms. Found May 27, Rutland County. monica from bremerton washington. found morels in my neighbors yard last sunday while walking the corgis. West Virginia, Jackson/Mason county area -- Found about 85 nice black morels, 2-3" caps. Found some on a North-West facing slope and most of the others on a sunny flat, all around tulip poplars and ash. Also found several tiny grays, just popping, on an old logging road/barn site in tulip poplars/sassafras/dead elms, but too small to pick. Going to check on them next Saturday. Had a major gully-washer on Friday night, and the grays were submerged in a couple inches of standing water! Going back out Monday morning. --Amanda W.
Jackson/Mason County area--My father-in-law and I went back out this morning and hunted most of the day. First few places were not very productive, just a couple here and there. On a whim we went back to a spot we picked two days prior and found a bunch more! Had a little more rain last night and this morning, so they must have popped up overnight, as most of them were in plain view. I didn't think they grew that fast. Altogether we came back with 65 black and 2 half-free morels. Made some mushroom soup out them, which I'd never done before...turned out awesome. :) BTW, I just wanted to let you know how much a I appreciate your website. It's very informative and laid out really well. I love to get on here in the days prior to hunting and stare at mushroom pictures until I dream about 'em!! --Amanda W.
Found 11 yellows from 1-2 inches tall in Licoln county on a dry mountainside covered with hickory trees hopefully will find more next time. 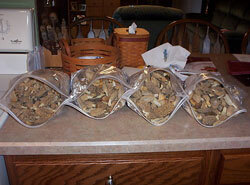 Rock County Wisconsin found three small button size morels on a south facing limestone ridge April 14 at 9:00A.M. Sorry we were unable to attach to your sightings link so we are sending this to you directly. Thanks Lizzy and Tim! Hi Tom, Vicky and all of the Nauman kids! The shrooms are up in Rock County, Wisconsin! Found 4 baby greys last night, Monday, April 17th - perfect size for my hat pins and magnets! Can't wait to see all of you - hopefully we'll get to spend some time together this season! You know where to reach me if you need help within the next few weeks - Beth M.
I found about five pounds of Morels this afternoon a few miles from Richland Center. About half of the mushrooms were small grays, but I found many yellows including about two dozen that were about three inches long. 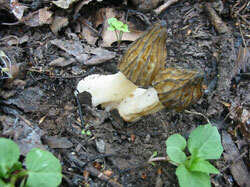 We had about a twenty four hour light rain that commenced around 1:30 Saturday - a Morel lover's delight. Had to go look today, couldnt wait another day. 63 and a lite rain but I found 38 tiny grays in the usual spots. I left some just to see if they get bigger in a few days. I found these in St. Croix Co. Wi. Love it when the sunnies are biteing AND the morels are frying in the same pan!!! Found 32 grays in Walworth County Wisconsin on May 1. All were pretty good size. 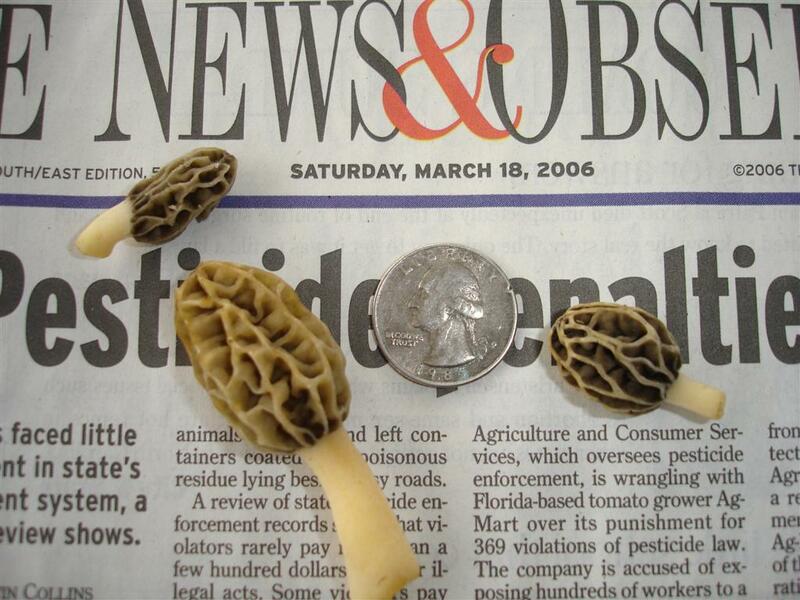 Chris and Krissy in Winnebago County report they found 108 morels last night near the Wisconsin border. Love those dead elms! 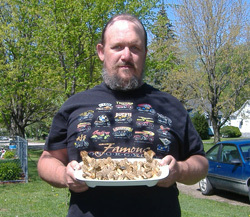 My name is Bob; I found 15 morels at the end of my driveway May 3rd 2006 ( Just taking out the garbage. They where growing along the edge of the west side almost on the drive at some spots. Is this normal. We live in southern Wisconsin in Burlington Wisc. right outside of Lake Geneva. today is the sixth of may and my brother hit the jackpot in wisconsin, southern polk county. one hundred sixty six beauties! right now he's frying some up with butter, of course! 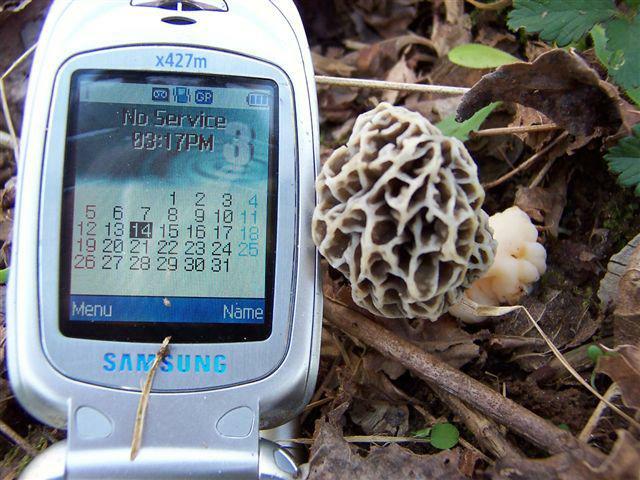 good luck to all morel hunters! John V. from Green Bay here with an update for Vernon County in SW WI. Found 20 good sized yellows on May 6 on warmer southern exposed hillsides. They're just getting rolling here & will benefit from the rain that's forecast for today & the rest of the week. The next warm spell should really get them popping. Good hunting! Found 20+ (sorry I didn't count) on a east facing slope above a calcareous fen. 2nd best find ever! We found 22 yellows east of Toronto, Canada under poplars. Little more than 1 inch tall. Will make pictures next time. Sandra. found 7 blacks today. Prince George, British Columbia, Canada. It was a joyful weekend of mushroom hunting near Plymouth Wisconsin. My friend Al experienced his first eye-popping hunt in a patch that produced a couple of pounds in constant picking ... glorious. Cheers to all.